Victorian tiled floors are timeless – despite first coming into popular use in UK houses during the 19th century, they’ve remained stylish in the eyes of many homeowners and interior designers. 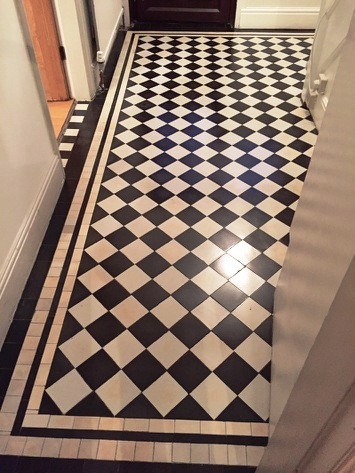 This fantastic black and white patterned example at a property in Derby dates back to 1929. However, the owners only recently discovered the floor, it having being hidden under carpet for many years. Discovering a tiled floor beneath carpet like this is, in my experience, a relatively common occurrence, yet it can be difficult to restore the tiles back to their original condition without professional assistance. In this instance – as is the case with most examples – the tiles were marked with numerous glue stains from where the carpet had been originally installed. 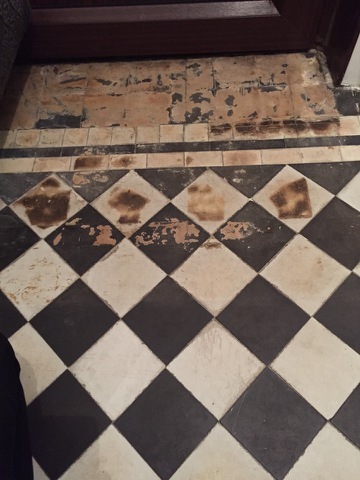 Initially, the customer had tried to clean the tiles themselves but, despite successfully removing most of the glue stains, they couldn’t achieve the full restoration they were hoping for. This is where I stepped in – to provide the floor with the deep clean and fresh seal it desperately needed. While the customer had succeeded in providing the tiles with a basic clean, I needed to take it one step further. To do this, I firstly mixed a strongly diluted solution of Tile Doctor Pro-Clean and water, before applying this to floor and scrubbing it directly into the tiles using a black scrubbing pad fitted to my buffing machine. Pro-Clean is multi-purpose high-alkaline cleaner, stripper and degreaser. This did the job to remove ingrained dirt in large areas of the floor, but in some places a stronger product was required. To tackle these stubborn areas, I used Tile Doctor NanoTech HBU, which was applied to the floor in combination with my steam cleaner. NanoTech HBU is a heavy soil build-up remover designed to reaches areas within the stone that other cleaners are unable to. It utilises nano-sized particles to penetrate below tough stains, dissolve them, and lift them out. After a thorough clean with this product the floor looked ready to be sealed. Nonetheless, before moving on to the sealing process, I carefully rinsed the entire floor three times with fresh water to rid the floor of any excess chemicals left over from the cleaning. I then removed the water with my wet vax machine. I left the floor to dry for five days as there was a slight dampness issue in one corner. When I returned to the property, I made sure the floor was completely dry by conducting several damp tests. The corner with the damp issue was just a bit damp still, so I opted to use my heat gun to solve the problem, and not long after the floor was ready for sealing. Removing all excess moisture before sealing is essential as it can cloud the sealer and damage its ability to protect the tiles. For sealing, I used four coats of Tile Doctor Seal & Go Extra sealer. This is a special acrylic-based formula which allows moisture vapour transmission making it fully breathable and ideal for situations where no damp proof membrane has been installed and where mineral salt deposits (efflorescence) are more likely to occur which is not uncommon with these old floors. As well as enhancing the appearance of the floor the sealer will provide a layer of protection to the surface of the tiles and prevent dirt and stains from becoming ingrained in the pores. The results of the restoration were fantastic – in fact, if you had seen the restored the floor for the first time, you might have thought it was only recently installed! As you can see from the Before and After photos, the floor was completely transformed, from a dull, dirty and worn condition to looking almost brand new. The customer was very happy with the work and no doubt will be much looking forward to showing off her new floor! 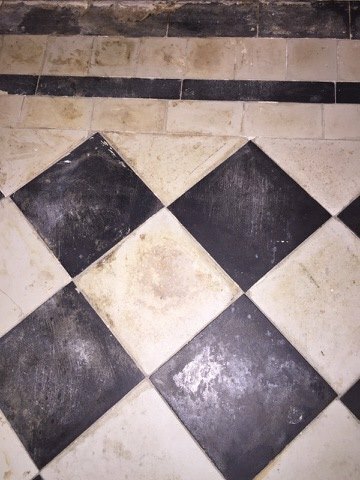 This entry was posted in Work History and tagged derby, derbyshire, tile cleaning, tile sealing, victorian tiles by abzdominise. Bookmark the permalink.